When tissue is removed surgically from the face, as is done in skin cancer removal, an open wound (or defect) remains. Reconstruction (or closure) of the defect may be done using many techniques, depending on its size, depth, location and surrounding skin type. If the defect is superficial and in an area of tension, such as the nose, a skin graft may be used to complete the reconstruction. A skin transplant involves taking a partial or full thickness section of skin from one area (called the donor site) and placing it inside the defect (the recipient site). The skin graft is often taken in front or behind the ear, leaving a small, straight scar hidden in the natural crease. When a larger graft is required, it may be taken from the lower portion of the neck where the scar is also hidden in the natural creases of the skin. 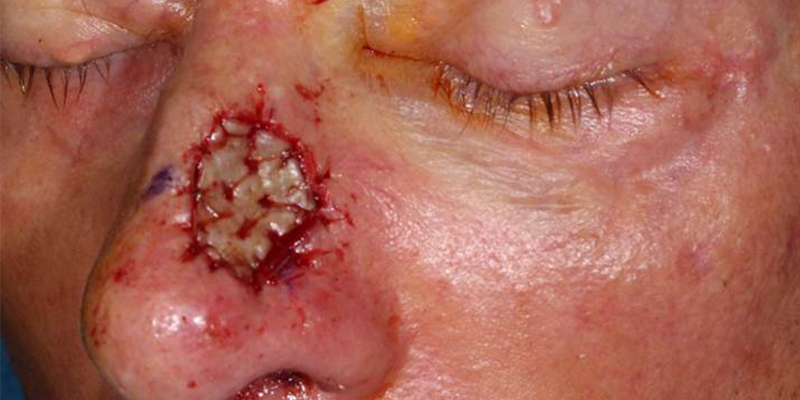 The skin graft is then trimmed to shape and sutured into the open defect. The graft may have a special pressure dressing, called a bolster, attached to it for a few days to prevent fluid accumulation beneath the graft during healing. Following skin graft surgery, the graft will have to go through several stages of healing. The beginning stages involve reestablishment of circulation. This will take 6-7 days. During this time, the graft will appear mottled, burgundy or purple. It may also appear concave initially, but will level out on its own. The next stage of healing involves regeneration of hair, sweat and sebaceous glands. Finally, the nerve endings reconnect and pigment is reestablished. These final stages may take up to a year. Sometimes, a portion of the skin graft does not fully survive and sloughs off like a burn. In this case, the area will reepithelialize and new skin will cover the area in a short time. Often the area is treated with dermabrasion after 4-6 weeks to blend the edges of the graft with the surrounding skin. The donor site scar fades to just a scratch or disappears completely. The advantages of skin grafts are ease of reconstruction, lack of need to place additional incisions such as with a skin flap, and lack of tension of direct closure. The disadvantages of skin grafts are poor color match (in 50% of cases), textural and thickness differences, inability to place a supporting cartilage graft under the skin graft at the time of reconstuction, and additional donor site discomfort. Skin grafts are not usually the optimal choice as far as appearance, but there are circumstances where skin grafts are clearly the reconstruction of choice. At SCARS, we offer this surgery to patients primarily in the Newport Beach area. If you or one of your patients in Orange County needs an emergency graft or will need a graft after another procedure such as a skin cancer removal, please let us know.